While public relations offers numerous assets for organization-stakeholder relationship building and for ethical corporate social responsibility and sustainability communication, it also faces challenges linked to negative perceptions of the profession which can lead to accusations of "greenwashing." 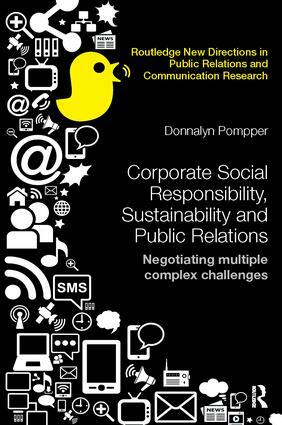 This innovative book critically explores the growing, complex and sometimes contradictory connections among public relations, corporate social responsibility and sustainability. This book advocates a postmodern insider-activist role for public relations which can transform organizations into moral places committed to people, planet, and profit. By amplifying voices of nearly 100 for-profit and nonprofit professionals, and using hermeneutic phenomenological theme analyses of CSR/Sustainability reports and websites, this book invokes public relations, postmodern and critical theories to empower public relations professionals to transform organizations into ethical, authentic and transparent actors in the public sphere. It is essential reading for scholars, educators and enquiring professionals working in public relations, corporate communication, sustainability and corporate social responsibility.